The ruins of ancient Hatra lie about three kilometers west of Wadi Al-Tharthar and about 105 kilometers southwest of the city of Mosul, in Iraq. Most structures are built in limestone an gypsum and are a mixture of Assyrian, Hellenistic, Parthian and Roman styles. 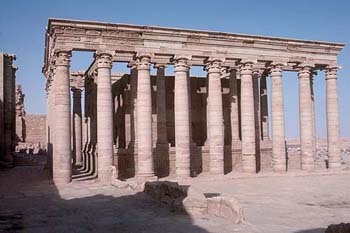 The fortress city of Hatra arose in Al Jazirah, where it guarded the two main caravan routes connecting Mesopotamia with Syria and Asia Minor. The date of its foundation is subject of some debate. Most likely it was the Assyrians, but by the first century BC it had undoubtedly grown into a fortified city.